Enclosure, things to pay attention to? I got an Anet A8 and want to build an enclosure for it. Since I'm currently only printing PLA, I would do it mainly for noise cancelling, because I have to run it in my room. I however want to have the possibility to upgrade it later with, say, an air filter etc., for example for ABS. Do I need ventilation slits? Would you put the filament inside or run it through a small hole from the top? Any tips for making it especially noise cancelling? Is wood the right material? Ventilation - Probably not, as you want to keep the print warm. 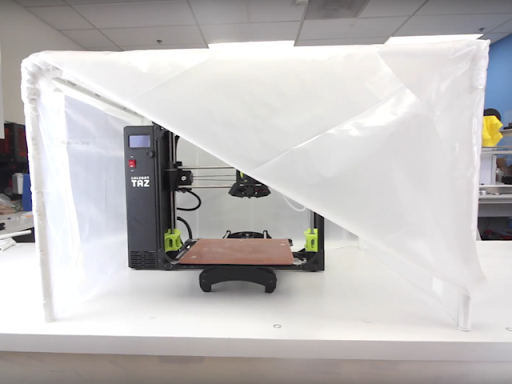 However, when printing with filaments where well ventilated conditions are recommended1, to prevent the build up of noxious fumes, from ABS for example, you would need (active) filtration, see this answer. 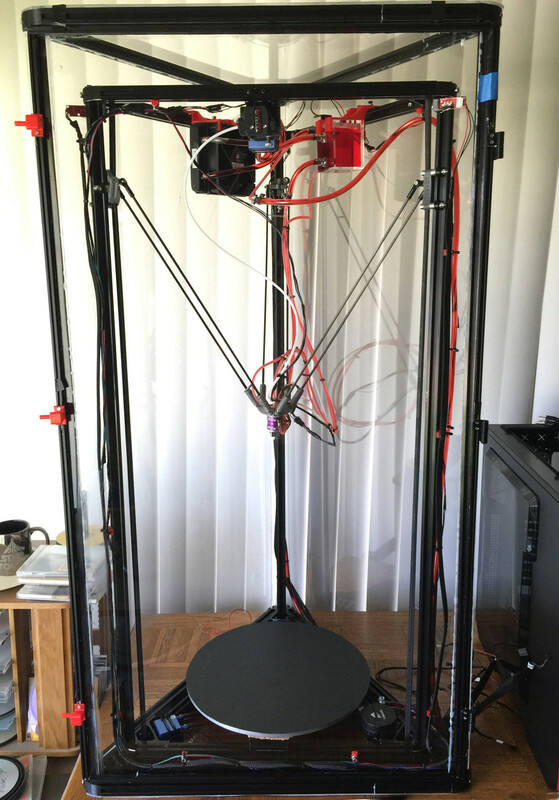 Filament Placement - I have seen printers fully enclosed, including the filament. However, there is the potential issue, especially if using PLA, that if the temperature inside the enclosure reaches temperatures approaching those of a closed car, on a hot day, then the PLA filament could become damaged/melt, and not roll of the spool correctly. In that case, you could place the reel on to of the enclosure and feed it through a (small) hole in the top. Feeding it through the side, could add additional resistance to it being pulled from the reel, depending upon placement. Material - As Mark states in his answer, be extra careful of thermal runaway, as 3D printers run hot, and an enclosed printer, even hotter. 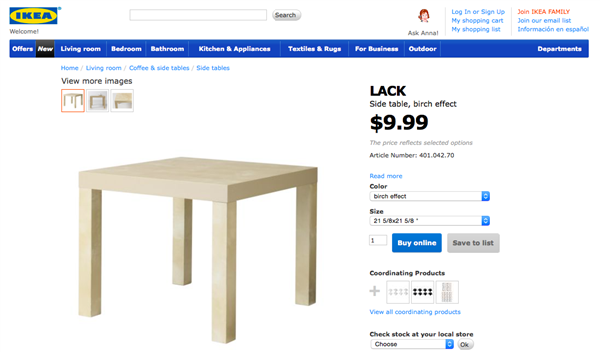 Wood is the sort of material you probably want to avoid. Whilst it is cheap, and would probably work fine in most situations, in the case of an emergency (read, fire), then you are merely providing additional combustable material. It would be advisable to stick with an aluminium frame (non-combustable) and glass (non-combustable and insulating). Electronics - You may want to consider placing the electronics (i.e. controller board) outside the enclosure, as the RAMPS board generally likes to be kept as cool as possible (especially the stepper drivers). Display/Control - Along with the electronics, it could be a good idea to also place the LCD display, and conjoint control panel, outside the enclosure, so as to provide ease of access. You don't really want to have to keep removing/opening the enclosure to change a minor setting. Access - Do you want a lift-off type enclosure, or have an access door? The latter is certainly more user friendly, or convenient. Sturdiness - Do you want a light weight (flimsy?) enclosure, or a heavier, more robust, enclosure? Safety - An air-tight fire box could be worth considering. For ABS, if you are using an air filter, you do NOT want ventilation, because ABS prints are better quality if the ambient temperature is up at 50°C (or even warmer), and ventilation will reduce your chamber temperature. Whatever has been helping for noise cancelling now should work in the future. Make sure and pay attention to safety. I have heard of more than one report of a RepRap printer going up in flames. On example of that is if the thermistor fails, or gets disconnected, and the controller puts the bed, or extruder, into thermal runaway. Make you make the enclosure out of a non-combustible material, so you don't add any fuel to the fire. Not the answer you're looking for? Browse other questions tagged enclosure ventilation or ask your own question. What air filtration options exist for enclosures? What kind of filter do I need for the enclosure of a 3d printer? 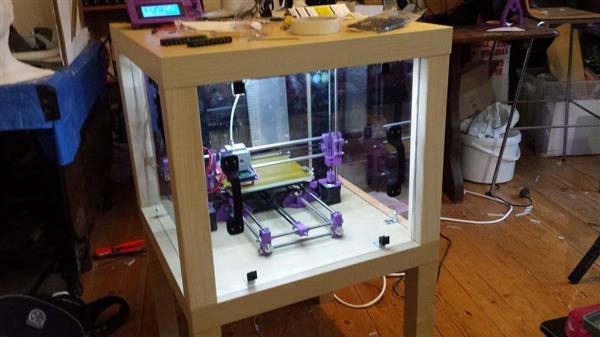 Using hardboard for 3D printer enclosure; what is the temperature rating of hardboard?